I think we’ve had this (one-way) conversation before so forgive me for banging on but I just loooove these hydrangeas at this time of year when their pinkness turns to autumn colours just before they die off. Enough said. Last blog for a while as I’m off to New England for a spot of leaf-peeping and family visiting. Very excited and paints are packed as I’m hoping to see lots of lighthouses, dutch barns and bridges. I’m also hoping to visit one of my all time painting heroes but more of that if it happens, when I get back. When I get back it’s all systems go for my solo show starting 1st November at the gorgeous www.thestratfordgallery.co.uk in Stratford-upon-Avon so why not come along; see some paintings, witness some Shakespeare and feed some swans. Happy October. There’s not a lot left in my garden but I have masses of this thanks to a friend who provides me with the babies in the spring. Now I’ve got a greenhouse, I should be able to rear my own next spring but we’ll see. I do love the way they fill the gaps in borders with their big saucer shaped flowers. It’s panic-stations at Chapel Cottage, trying to get ready for my solo exhibition before I’m off on Friday to New England and Washington. There is no room at my kitchen table to eat as it’s constantly full of paintings to varnish and frames to paint……..good job Jobbers is away. I’m very excited about this exhibition as it’s at a beautiful new gallery The Stratford Gallery in Stratford-upon-Avon and runs throughout November. More details later but in the meantime, here’s a little sketch made in Yorkshire in July while I was having a blast painting in the company of the amazing Jeremy Lipking. I’m hoping to do a larger studio piece from it in time. It was made on the day after I slid down a staircase and damaged my somethingorother ligament in my knee. I’m still hobbling! And no, before you comment, it was first thing in the morning, not gin and tonic time. This little painting was done in lieu of another that was sold but somebody wanted. It’s gratifying to see how I’ve moved on (hopefully forward) since its predecessor was painted. One of the reasons I started these little sketches was as a record of progress for myself. 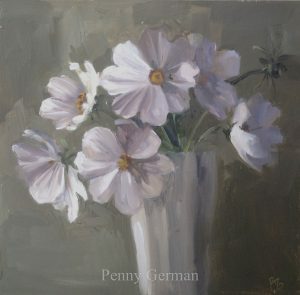 Well, the second workshop last week was flower painting and a very generous student brought a plethora of painting subjects…..so many that we couldn’t choose so I rather crammed them into the vase in order to demo each type. Whoops, apologies for lack of posts last week – it was a busy one. The first two days were workshops and here’s my demo painting from the first. Lots of lovely workshoppees who produced some great work. This was hastily painted in a somewhat compromised space as I’d got my admin wrong and had two students over my normal intake! Fun though. Got loads to do so am posting this quickly. 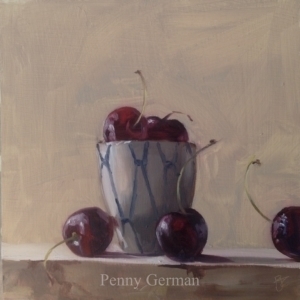 A few cherries left over after finishing a larger painting. I’ve got workshops on Monday and Tuesday which I’m looking forward to so no blog till Wednesday. Have a lovely weekend. My tree is drooping under the weight of these little beauties. We’ve had crumble, compote and plums with chips (not really). Am running out of ideas and desire to be honest. I’ve only managed this one little painting too as I’ve got such a lot of work going on preparing for an upcoming solo exhibition in November. More on that later. I love this little square pot that I picked up in Copenhagen in the winter…….delish! Love a beautiful pot. Well, I had a lovely time in Italy and feeling rested and raring to go. Whilst I unruffle my feathers, here’s one I made earlier. It will be part of the exhibition The Coton Manor Year I’m holding at 78 Derngate, Northampton in February which will feature year-round plein air and still life from that most marvellous garden.